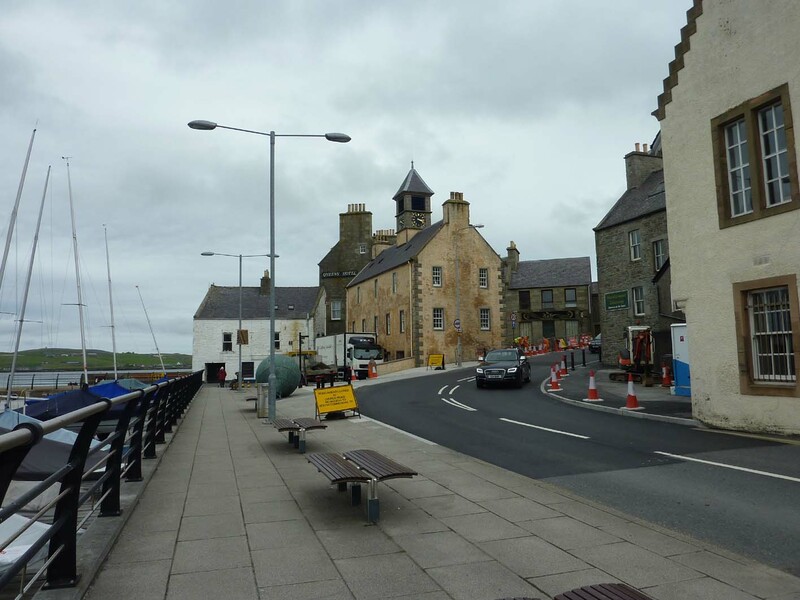 After a whole day touring Shetland, we booked into the Queens Hotel in Lerwick, tucked away at the corner of the harbour. The coach was allowed to stop to unload, but the area was forbidden to other traffic. We were told that this was because there was to be filming in the area. Queens Hotel, Lerwick. Behind the barriers. 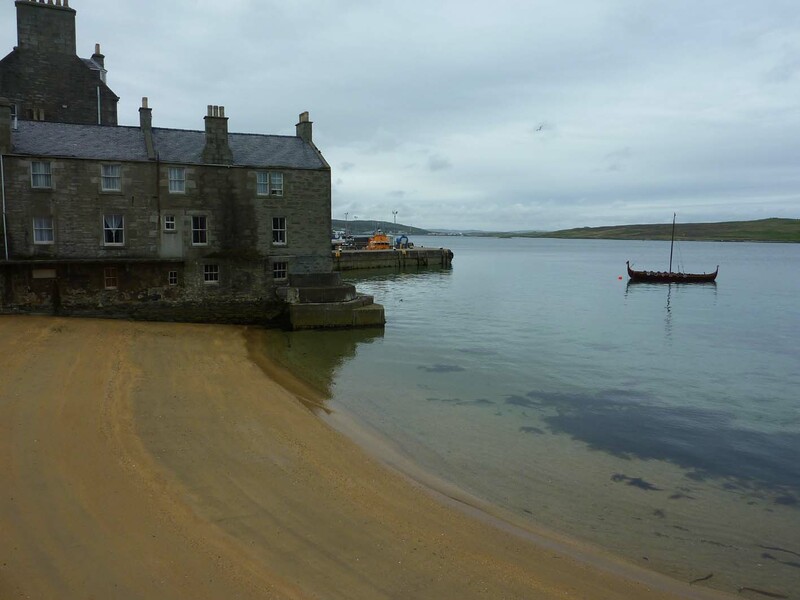 One of the reasons I had wanted to visit Shetland was because I had watched the TV series “Shetland” based on the books by Ann Cleeves. A scene from the new (fourth) series was to be shot there the following day. We did wander back later to have a look, but although there was a lot of equipment lying around, we didn’t see any action. I’ll certainly be watching the next series – and reading the books. I don’t know if it was to do with the filming, but when we went out for a walk that evening, we found a Viking longship moored just behind the hotel. It wasn’t very big, but it gave us a bit of a shock. Queens Hotel and Viking ship – our room looked out onto this tiny beach. We survived the night without being raped and pillaged and checked out next morning. 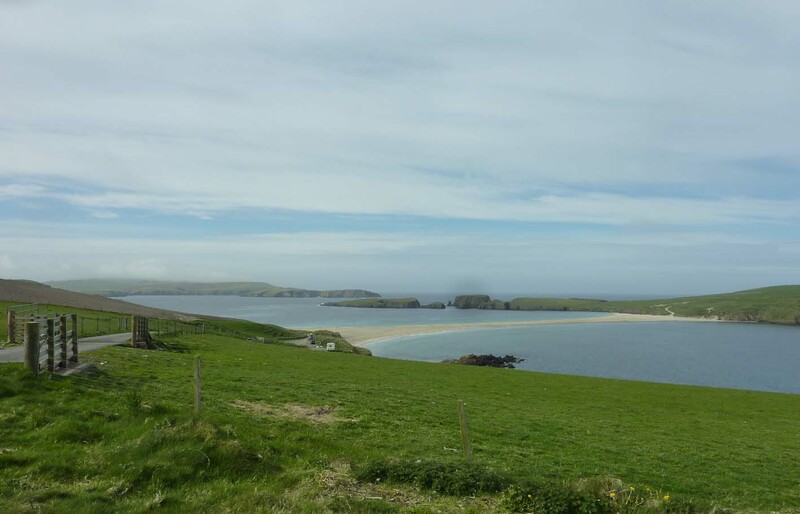 Again the coach travelled south, but then took a road to the west coast to visit St Ninian’s Isle. We didn’t actually “visit” the island, which is attached to the mainland by a sand tombolo. Perhaps there wasn’t time, or we weren’t considered fit enough, but the view was enough. 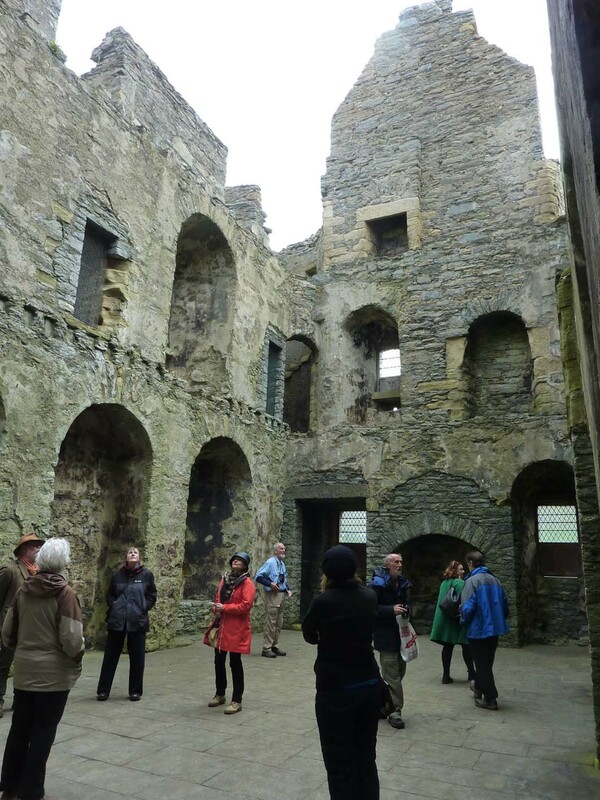 There is a ruined chapel on the island, dedicated to St Ninian. When it was excavated in the 1950s, treasure from the 9th century was found there. The collection of silver brooches and other objects is now in the Shetland Museum, which we visited later, so I suppose we didn’t really miss anything. 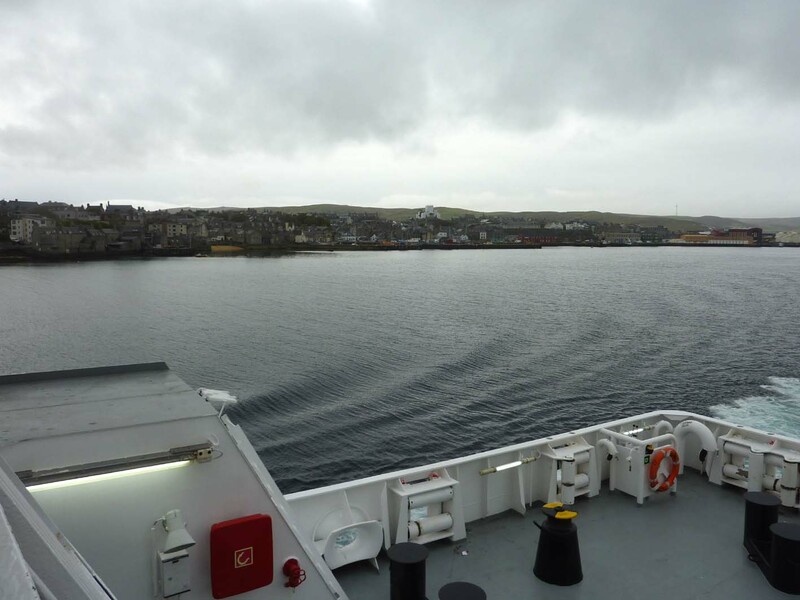 Then it was back north, to Scalloway, the former capital of Shetland. 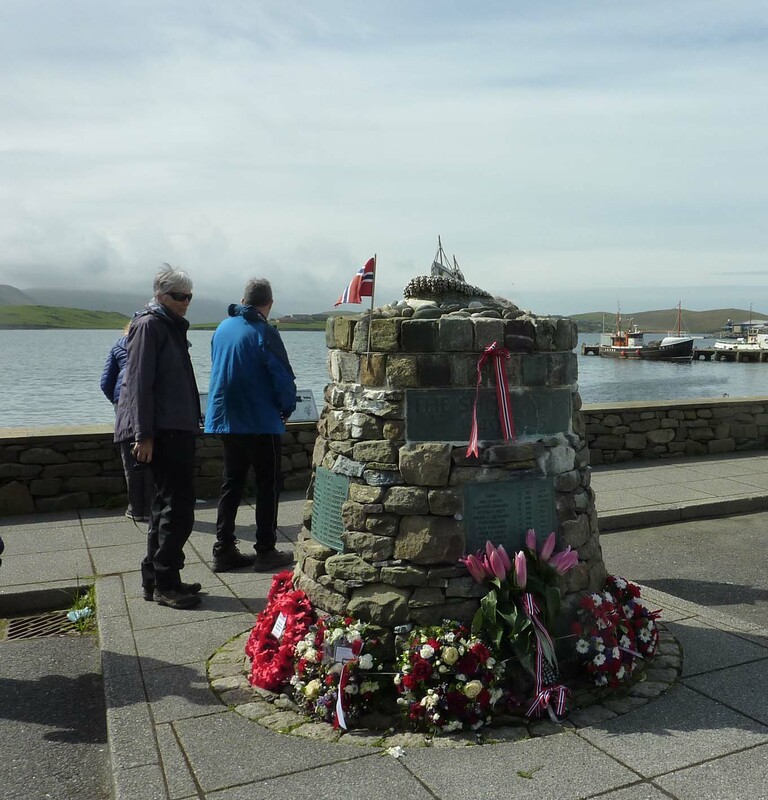 We had a brief visit to the “Shetland Bus” memorial, before a visit to the Scalloway Museum, where there is a display telling the story of this WW2 operation. After the occupation of Norway by Germany in 1941, small fishing boats were used to transport men and equipment to aid the resistance. Next door to the museum was a castle, which we also visited. 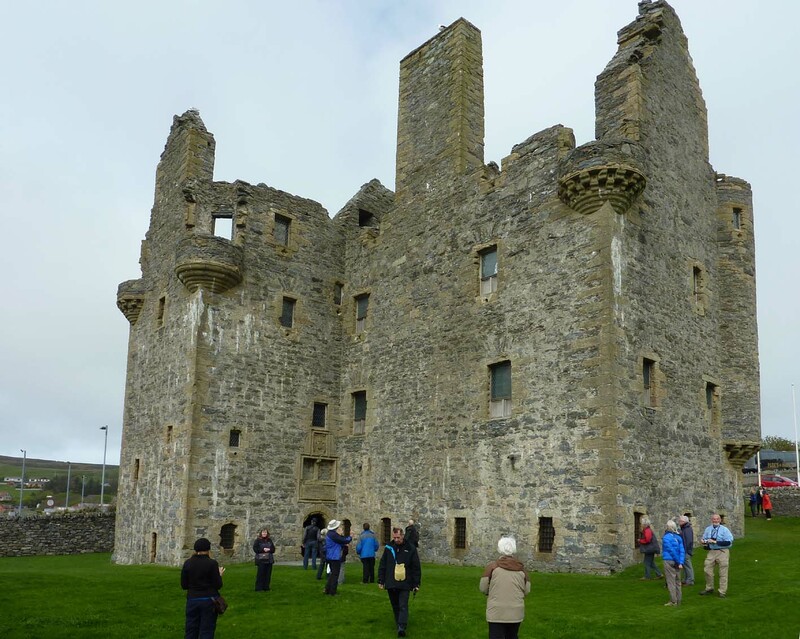 This was built in 1600, by the notorious Earl Patrick Stewart, who we had met the day before at Jarlshof. Patrick Stewart was the 2nd Earl of Orkney and illegitimate cousin of James VI. He was not much liked by the local citizens, as, amongst other things, he forced them to work on his castle for no pay. They complained to the King and eventually he was summoned before the Privy Council in 1609. He was imprisoned and eventually executed in 1615, in Edinburgh. The castle was abandoned. 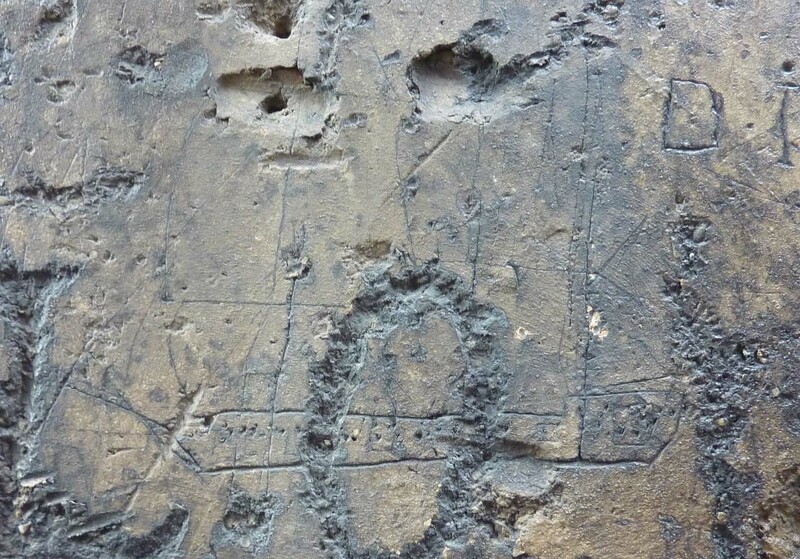 It is interesting for the graffiti that has been found in the great hall. Some bored visitor had carved pictures of ships that would have been visible in the harbour below. We returned to Lerwick via Tingwall Valley. The Ting was the old Norse Parliament. 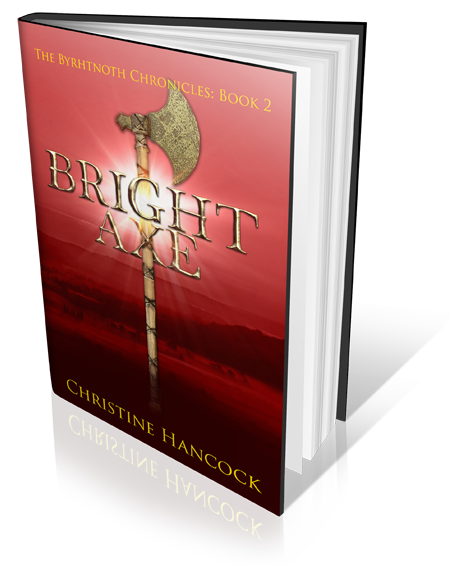 This was originally held on a small island in the loch, reached by a stone causeway. The coach stopped in a lay-by, already occupied by workmen, so we were unable to get out for a proper look. It would have been nice to have spent more time exploring the area. Perhaps we will come back another time, by ourselves. 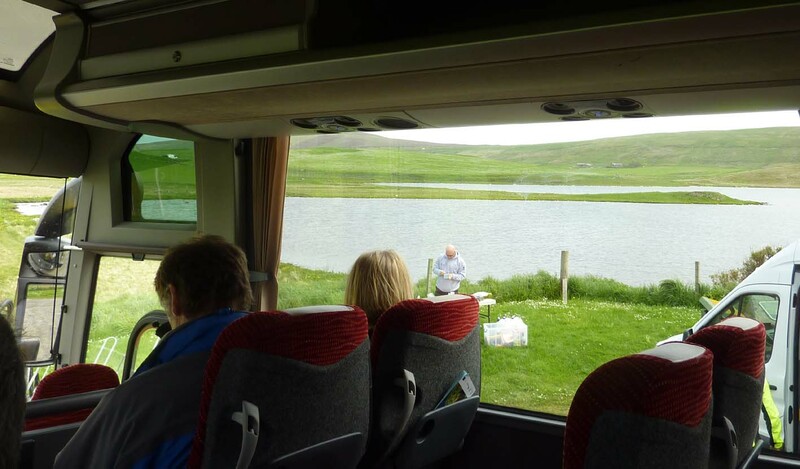 There is so much to see in Shetland, the tour can only cover the highlights. In the afternoon we had free time in Lerwick. We were dropped off near the Museum. After a lunch of scones (which had been recommended) we looked round the Shetland Museum. It was large, modern and had many interesting exhibits. We confined ourselves to the archaeology section; the St Ninian treasure and some beautiful stone tools. 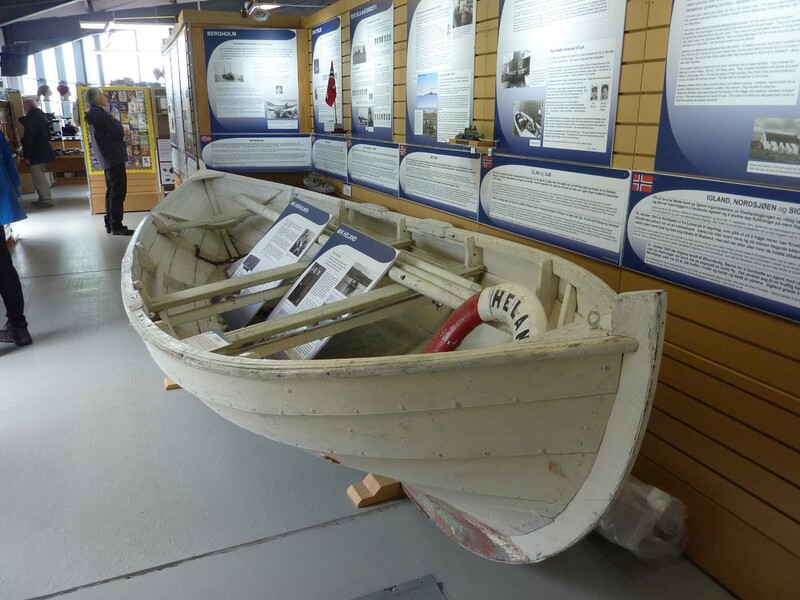 Plus a lifeboat from the RMS Oceanic, predecessor of the Titanic, which has recently been restored. Shetland Museum, different styles, one amazing building. 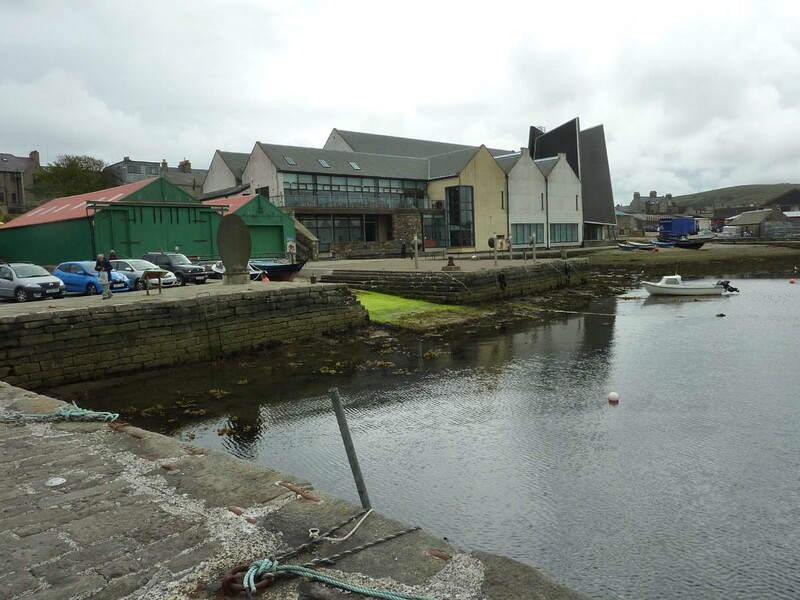 We had had enough of the “museum shuffle” so set off to explore the rest of Lerwick. 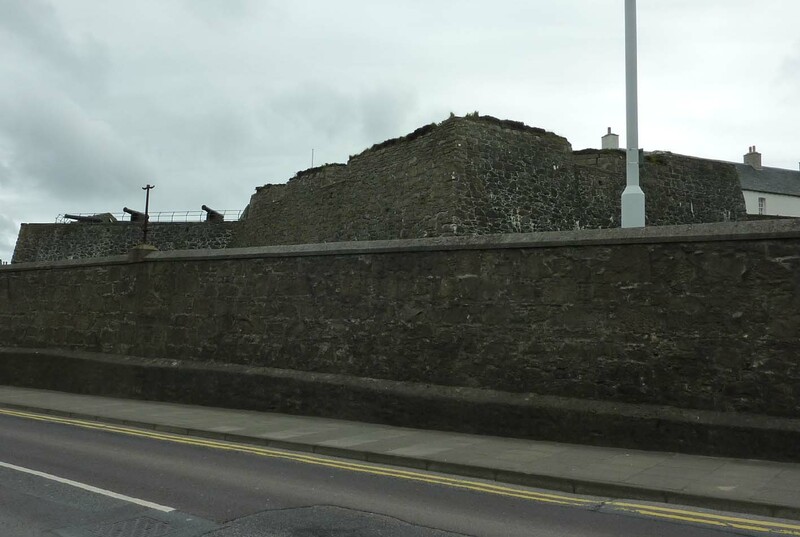 We looked round the shops and visited Fort Charlotte, originally built to deter the Dutch during the Anglo-Dutch Wars. It was rebuilt in its current form in 1781 and named after the wife of George III, but never used in anger. Tired and footsore, we returned to the museum, in time to be picked up by the coach and delivered to the ferry. The ship sailed at 5.30 for Orkney. This was a shorter crossing, no cabins this time. We had dinner on board and arrived in Kirkwell about 11pm. It was a short coach ride to the Kirkwell Hotel, where the service was very efficient and we were soon heading for our rooms. We were on the third floor, so decided to take the lift. We had been warned about this, it was one of those old-fashioned types where you have to pull the gate across before it will move. We waited while someone else went up, it returned quickly. It contained three large suitcases – but no people. I’d had enough, we dragged our suitcases up to the third floor. Viking ships, haunted lifts. What more did this holiday have in store for us?